Part installation, part social commentary, German artist HA Schult’s massive Trash People (or “Schrottarmee” in German) presentations have traveled to Paris, Moscow, Peking, Brussels, Rome, New York and have been installed in some of the greatest landmark sites in the world, like The Great Wall of China, The Pyramids of Giza, Grand Place in Brussels, La Grande Arche in Paris and most recently in Antarctica (in 2010). His art creates a visual testament to the trash that will become tomorrow’s archeology. 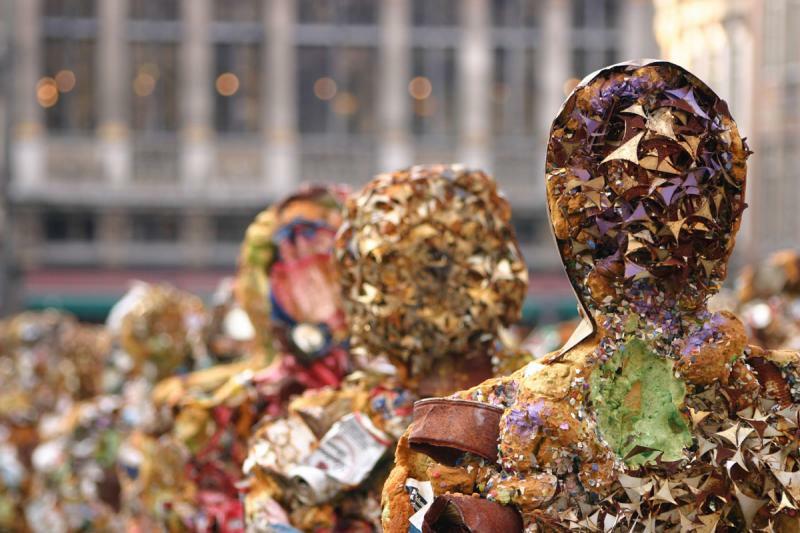 The Trash people are life-size statues made of garbage, with faces molded from tin cans, chests constructed of electronic waste and limbs shaped from crushed plastic — all carefully formed into sculptures intended to showcase society’s reckless consumption and looming garbage crisis. In the U.S. alone, 4.39 pounds of trash per day and up to 56 tons of trash per year are created by the average person. This number is increasingly rapidly, not only in the U.S. but also in countries around the world. In 2000, humans produced 13.9 billion tons of trash, more than 2.2 tons per person; by 2050, we will probably produce 29.4 billion tons. Not only is the planet in urgent need for better garbage disposal and recycling solutions, but also a mindset change that will help us learn to consume less and find sustainable ways to dispose off and recycle the waste we create. By doing nothing, we risk causing long-term damage to our environment and ultimately human health and survival. I can’t believe I never heard of this. Looks like they didn’t get much coverage in the States. Pity!